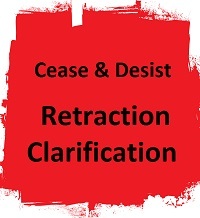 To those who have published false and/or defamatory information about me: CEASE AND DESIST. Continued false and/or defamatory statements about me should be viewed by law enforcement as stalking and should be viewed by judges and juries as evidence of malice, bad faith, and reckless disregard. As to my demands for corrections and retractions, it is too late for anyone to correct and retract statements made over 30 days ago. But if you have made false and/or defamatory statements about me in the last 30 days, I demand that you correct and retract. There are hundreds of screen names who have published false and/or defamatory information on joeyisalittlekid.blogspot.com. I ask whoever is the owner/operator of that site to publish this article on that site so all of the people who frequent that site know the truth and know of this demand to cease and desist and for corrections and retractions. It is impossible for me to list each specific false and/or defamatory statement as yet because there are thousands, if not tens of thousands, of false and/or defamatory statements or support for such statements, and I have not yet been able to read everything. If you haven't been keeping up with Lawless America and me, you may be surprised to learn that a gang of cyberstalkers has viciously defamed William M. Windsor with thousands of false and defamatory statements online. Let this serve as a Cease and Desist notice to all my cyberstalkers as well as a Correction and Retraction Request. Through March 2014, there were over 320 articles filling over 7,000 pages on Joeyisalittlekid.blogspot.com, written by about 700 screen names, 99% of which are aliases or anonymous.